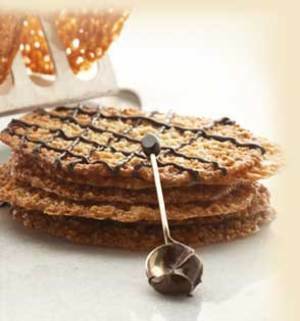 Oh, how I wish I could say that I made these yummy cookies and they're cooling on my counter top this moment! But, that's not my counter top and those aren't my yummy cookies. I am hoping to try the recipe, however...plus 11 more. I've subscribed to Food Network's 12 days of cookie recipes newsletter (it's free!). Check it out here if you're interested in signing up for 12 days worth of cling-to-your-hips decadence. If you're a fan of Super Gooey Chocolate Drops, Booze Balls or Whoopee Pie, you can browse through the cookies of Christmas past. 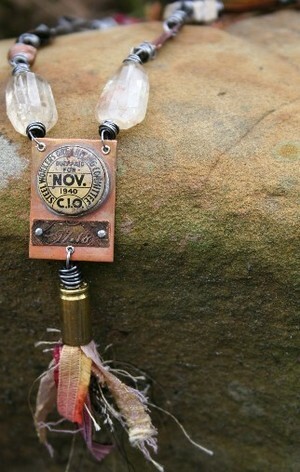 And, speaking of 12 days...my 12 days of Christmas ornaments group opens ornament number 1 this Saturday. Make sure you come back then to see! 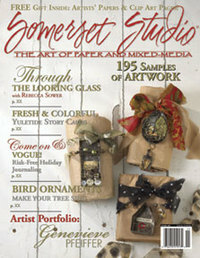 Have you seen the Nov/Dec issue of Somerset Studio? 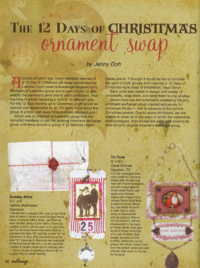 Jenny Doh wrote and published a great article about a swap I'm in called The 12 Days of Christmas Ornaments. 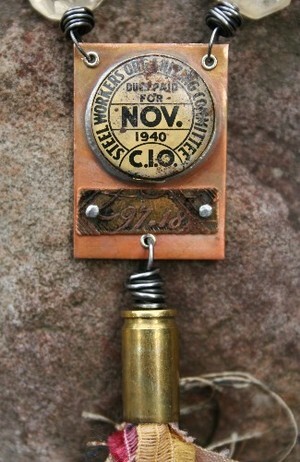 12 artists are creating ornaments (12 each) for swapping, beginning Dec. 1st. Traditionally, the 12 Days of Christmas begin on Dec. 26th but, in the interest of being able to enjoy our ornaments longer, we'll be opening them early. 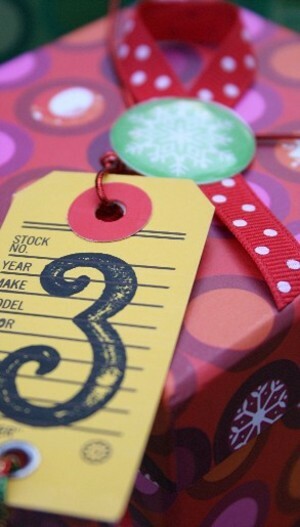 Each day, each participant will open one ornament. 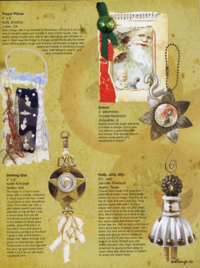 Somerset has published beautiful photos of each of the 12 ornaments plus a few from last year's swap. Aren't the ornaments fabulous?! I've been in a Christmas ornament swap for the last 3 years or so with pretty much the same people and, I have to say, this has been my favorite swap of all time. I guess it's because I adore Christmas so much but also, I love the surprise of pulling out the ornaments each year and remembering which of my friends created them. Last year, a friend of mine Lelainia Lloyd organized a group of 12 of us to swap Christmas gifts (not ornaments). She called it the 12 Days of Christmas swap and organized a blog for us. 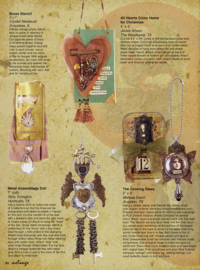 I loved the way the gifts were opened, one each day, representing the 12 days. Lelainia's swap inspired me to organize the ornament swap for this year in the 12 days style. My ornament group is starting to mail out the goodies now. Since the project was put together, we've had a few changes in the artists participating and most of the ornaments will be different than what you see in the article so it will be fresh when we start opening packages. I'll be posting each one to my blog, starting Dec. 1st so stay tuned...you won't be disappointed! So, what do crosses and sparrows have in common? It seems like a strange combination at first but they fit together better than you might think! When I started this piece, I actually had in mind only the verse above but I ran across several others as well. 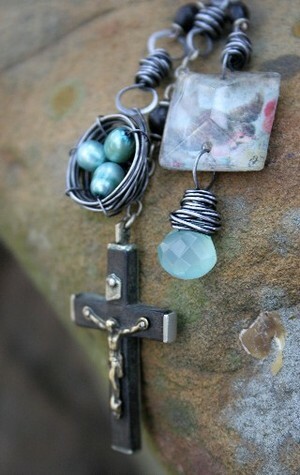 For this piece, I used an old rosary cross, vintage chandelier crystal and one of my signature wire birds nest charms. I use the term "signature" loosely! One's signature is defined as an identifying mark or characteristic. I don't really consider any one element of my work to be my signature. After all, fads come and go and techniques are available for anyone to put to use. I'd rather have people look at my work and be able to identify that it's mine through my overall style...through the meaning and message they see there. That really means something to me! 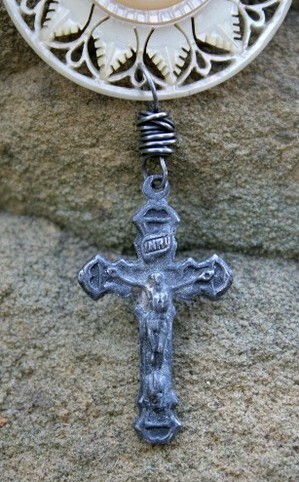 My jewelry, and my other artwork, has a definite spiritual aspect that I believe defines my signature. That spirituality is something my pieces are infused with...something inseparable from my artwork. Something sublime! 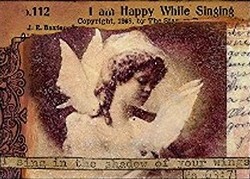 Like a fluttering sparrow or a darting swallow, an undeserved curse does not come to rest. What is the price of two sparrows—one copper coin? But not a single sparrow can fall to the ground without your Father knowing it. Even the sparrow has found a home, and the swallow a nest for herself, where she may have her young— a place near your altar, O Lord Almighty, my King and my God. I used two different elements from the sea: mother-of-pearl and these beautiful, deep green, freshwater pearls wrapped with wire and beads. 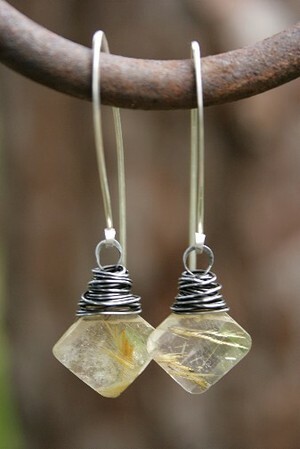 I also added incredible rutilated quartz faceted drops. 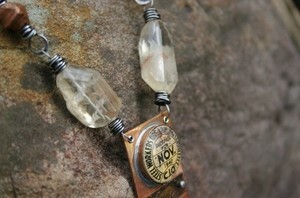 The golden spikes encased in the quartz, and the facets, make these drops twinkle. 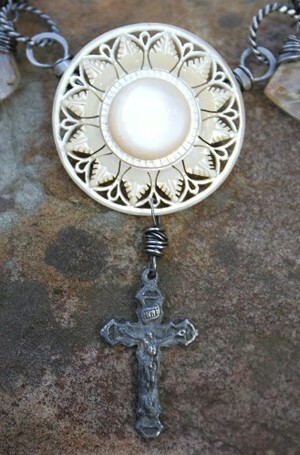 You can see the brooch is very intricately carved and it glows beautifully in the light. 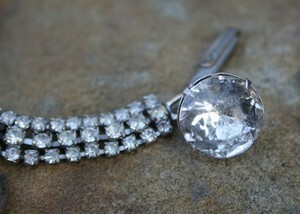 I created the piece so that the brooch is removable and can still be worn as a pin. 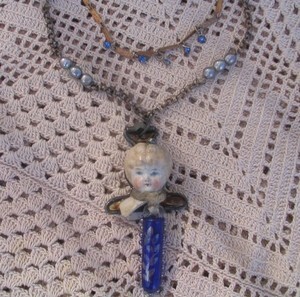 A vintage crucifix from Mexico dangles below. 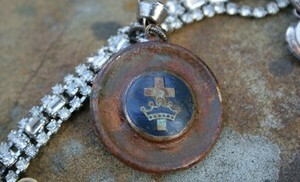 Crusty, weathered and worn...well loved, just like I like! 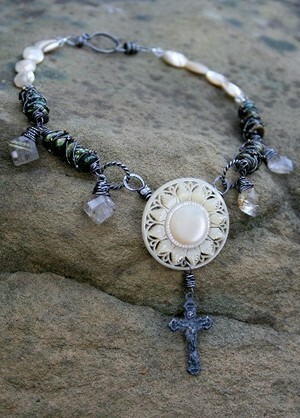 And lastly, faceted, mother-of-pearl beads, vintage crystal beads and a hand turned clasp. There's something sublime here for you to see. 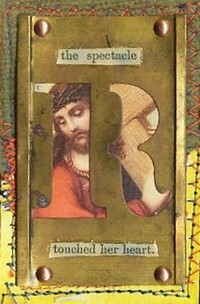 Beginning with a friendship-- My sweet girl Pilar sent me this card the other day. She was out somewhere and spotted it...thought of me...dropped it in the mail. No strings attached, no ulterior motive...just a kind thought of me. 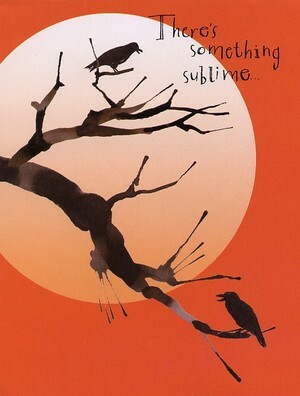 It's the perfect card for someone who's blog is called "Something Sublime" and whose name is Deryn. I didn't realized this until I had internet access: my name, in Welsh means "bird". One reason for my love of things to do with birds, nests, twigs, cages, etc. Pilar, do you like these? Now on to another sublime relationship. My mom has always been a best friend to me. She was a young mom...the prettiest one of all my friends moms (I thought so...still do!). She was born in November of 1940. In my "junque" collection, I came across the perfect treasure to build her a piece of jewelry...this Steel Workers button. Sublime serendipity! 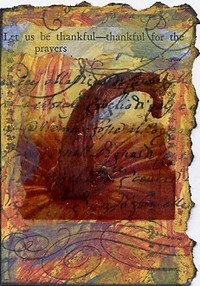 I started this piece in a class I had with the fabulous Jane Wynn. I created a bezel for the button and riveted an etched piece of metal below it (special numbers there as well). 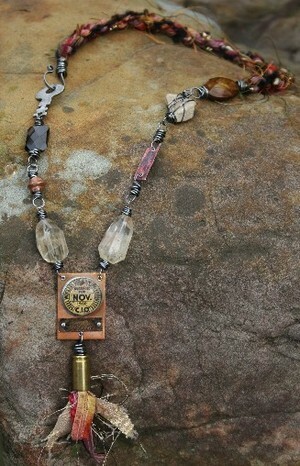 I used a shell casing to house a fiber tassel. 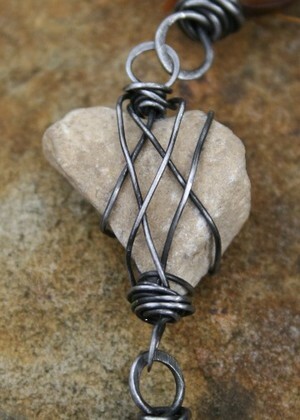 The cord is made from many fibers twisted together. I think she'll love this stone heart found by her grandson. 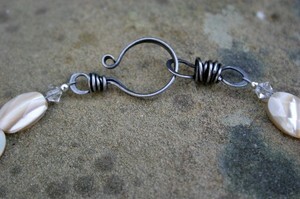 Number Two (no, that's not the order in which I love them!) is constantly on the lookout for all kinds of debris for me to use in my artwork. 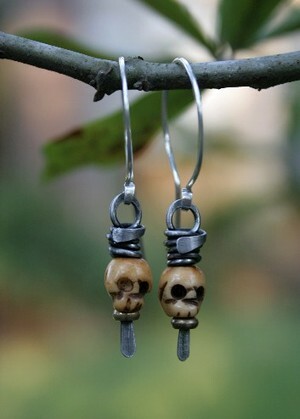 This was probably found during one of his camping expeditions. Don't you love the definition of the word "sublime"? 1. Characterized by nobility; majestic. 2. a. Of high spiritual, moral or intellectual worth. b. Not to be excelled; supreme. 3. Inspiring awe; impressive. 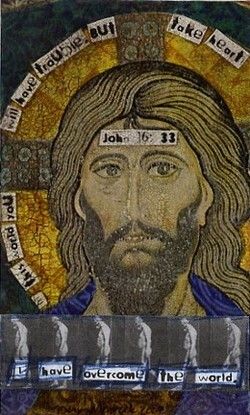 4. to convert (something inferior) into something of higher worth." When I adopted that definition to be a part of my blog, I certainly wasn't thinking of a description of myself, or even of my artwork! 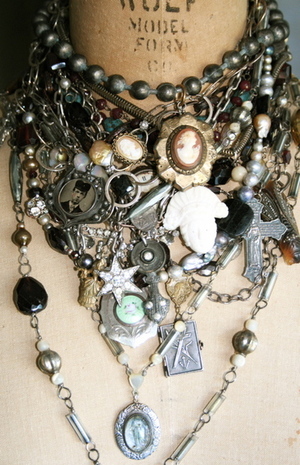 Although, the last bit of it--"to convert something inferior into something of higher worth"--describes my jewelry perfectly. What I really had in mind was a definition of someone truly excellent and supreme...influencial in my artwork and in my life...my sublime Muse. Take a look at Michelle Ward's Green Pepper Press Street Team blog. 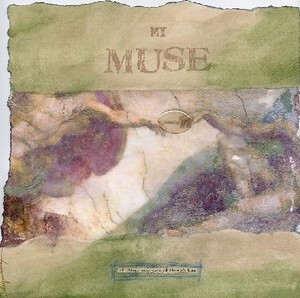 The art challenge for Crusade #14: Who or what is your muse? 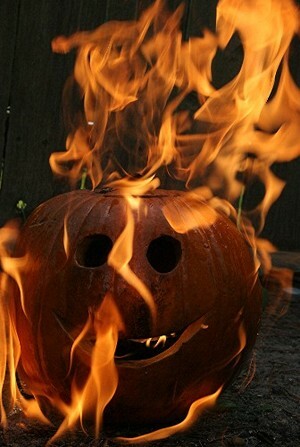 This is what happens to moldy jack-o-lanterns at our house. Halloween is over and we're marching for the next holiday so...so-long Jack! Of course, this inferno was the brainchild of the mini-men. Hey, if something needs to be disposed of, why not burn it up?? Give them a can of lighter fluid and a pack of matches and they'll change the landscape... or, at least burn down the neighbor's fence! 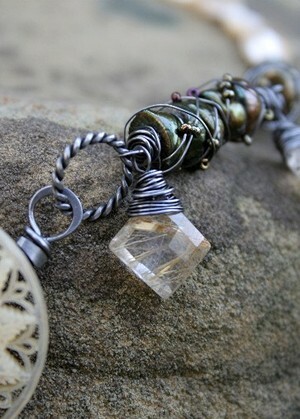 ...I actually saw your work in Belle Armoire and that is what inspired me to start creating jewelry and I would study your tutorials and the tools you used and actually purchased them and so I started making jewelry. 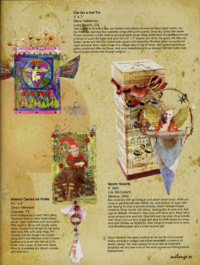 I now have an Etsy sight and will be published in the Nov/Dec edition of Belle Armoire... I wanted you to know how you have touched my life and for some reason that I don't know I just decided that I wanted to create jewelry too. I have a passion for it now that does not seem to be cooling down. Bless you for what you share with others, you touch lives unaware. Is that not the kindest compliment? The part of Cindy's email that I love the best is the idea of touching lives unawares. It makes me think of the passage from Hebrews 13:2...Be not forgetful to entertain strangers; for thereby some have entertained angels unawares. I don't presume to be a great, inspirational influence on anyone. I love to create and I love to share what I create. But, Cindy's email, and the Hebrews passage, reminds me that we all have an influence on others...for better or for worse...whether we're aware of it or not! Who knows what wonderful, inspiring effect a few kind words might have? Or, maybe you've had the opposite experience?...been the deliverer or recipient of un-kind words? It's not coincidental that Hebrews 13:1 exhorts us to "Keep on loving each other as brothers". 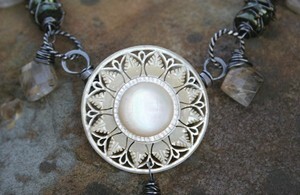 I was visiting the gorgeous blog of Pam Garrison and noticed that Amy Hanna has a load of new jewelry posted to her etsy store. 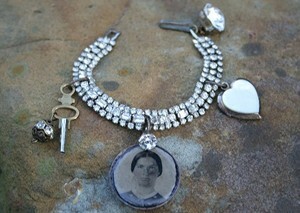 If you haven't seen Amy's jewelry, run...don't walk...to her store and take a look! Don't you love this photo? It makes me want to run my fingers through all those trinkets!